SEOUL -- A massive clean energy complex will be built on reclaimed land in South Korea in a state project sponsored by President Moon Jae-in who has launched a campaign to replace nuclear reactors and other fossil-fueled power plants with renewable energy sources. The cluster will be built in Saemangeum near the southwestern port city of Gunsan. A seawall stretching 33 kilometers (20 miles) was built in 2010 to convert an estuarine tidal flat in Saemanguem into agricultural or industrial land. It was certified by Guinness World Records as the world's longest man-made sea barrier which created an area of about 400 square kilometers and a freshwater reservoir. Saemangeum has been at the center of debate over how to use and develop the area. Previous governments have mapped out different blueprints such as the construction of an economic and trade hub, but progress has been slow. President Moon Jae-in unveiled a fresh project to use about 38 square kilometers for the construction of a clean energy complex with a total capacity of 3.0 GW. 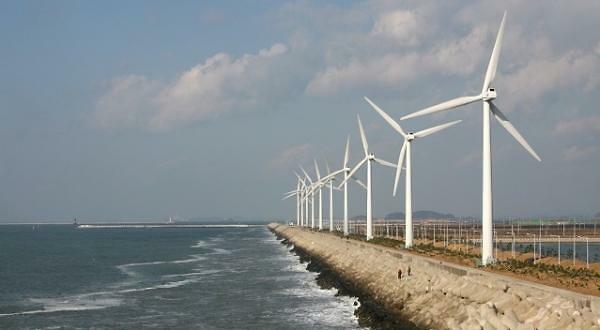 In waters outside the seawall, an offshore wind farm with a capacity of 1.0 GW will be built. The project requires a state fund of 590 billion won ($517 million) for four years and 10 trillion won from private sectors. "The world's largest solar power complex and a large-scale offshore wind farm will be built at Saemangeum," Moon said Tuesday in a ceremony in Gunsan, describing the new energy complex in Saemangeum as "a landmark turning point" that would enhance the competitiveness of South Korea's renewable energy industry. Land, Infrastructure and Transport Minister Kim Hyun-mee testified in a parliamentary audit this week that the government would not dump an earlier blueprint to establish an economic and trade zone in Saemangeum. "We are creating a new renewable energy complex in a Saemangeum area where it is difficult to set up an industrial complex due to the noise of airplanes." For decades, South Korea, which has almost no reserves of fossil fuels on its territory, has pushed for a nuclear energy program. However, the number of nuclear power plants would be cut from 24 to 14 in 2038 under a new energy roadmap to reduce the use of fossil and nuclear energy.